Drive a tank, fly a plane, wander around a map in a confused and dazed state ... this has it all. First person shooters usually, as the name suggests, involves strange american teenagers called '7l33t Ha><or' or something running round shooting you and telling you that you are a lam0r. Yawn. 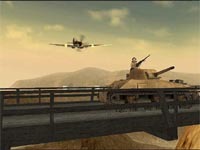 Well, with Battlefield 1942, not only do you have the team play atmosphere of Wolfenstein, but also truly interactive objects: vehicles, warships AA cannon ... take 'em for a spin! Yes, I have finally found out what the internet is really for, and its Battlefield 1942. The game itself (and I only have the demo right now -- released next month), makes Wolfenstein and Medal of Honour seem hopelessly crude. I have played the demo for something like 20 hours now, and with just the one map there is so much variation of gameplay that I don't think I'll get bored for a good few weeks yet. Many thanks to Edpow for writing most of the pages on the right. As you'd expect, you need a preeeetty damn powerful computer to handle all of the 3d malarky, and also the servers have an annoying tendency to lag and then disconnect you. This isnt much to do with ping, but probably some really dirty netcode. Hopefully they will have sorted this out in time for the main game. Its by EA, so I have every confidence that they will. Accuracy: I am not sure how much this is due to the servers lagging, but shooting seems to be hit and miss, particularly at close range. Aircraft: sometimes you crash when it looks like you are a hundred feet up. again, this could be because of lag. Over the Next couple of months The Glorious Gross Dachshund Division will be organising regular meets and practise matches. Follow our progress here, or challenge us to a scrim.